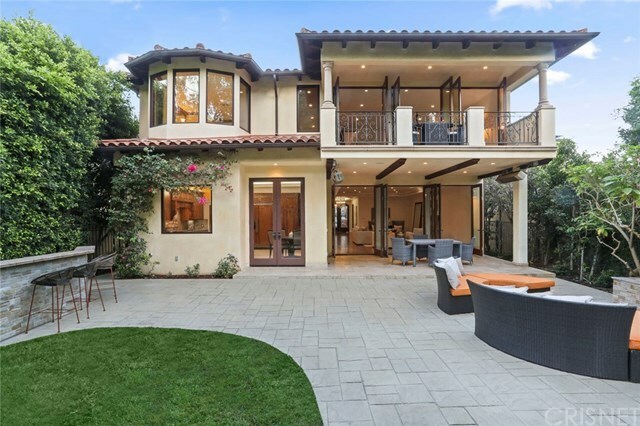 Custom built, Mediterranean style home in the prominent Brentwood area, this stunning estate presents a lifestyle without compare. With wood and travertine floors, crystal chandeliers, and crown molding, every detail is exquisite. Approx. 4,700 sqft, this 2-story home displays 4 bedrooms, and 4.5 baths, formal living and dining rooms, and a custom wine cellar. Greet your guests in your grand entry way with a gorgeous spiral staircase with uniquely designed railings. Open floor plan concept, perfect for indoor/outdoor entertaining. Gourmet Chefâs kitchen that is fully equipped with top- of-the-line stainless steel Viking appliances, granite countertops, center island, and cherry cabinets, a perfect space for hosting dinner parties, serving hors dâoeuvres, and enjoying a bottle of wine from your wine cellar. A stunning master suite on the 2nd level with French doors that open to a private balcony, oversized walk-in closet with a master bath with his/her vanity space, beautiful bathtub & steam shower. Upstairs, two more bedroom suites, large family room, and laundry room. While downstairs, a 4th guest bedroom with an en-suite bathroom. Secluded, spacious yard with a wonderful fireplace for cool evenings, custom grill, sparkling spa, and covered patio with heaters.